Most people need some food photography tips because photographing food so it looks real and appetizing is not easy. Check the backlit images of the dishes at a local take-out restaurant to understand why. If the food actually looked like that, all green and blue and like it was made in 1960, no one would want to eat it. Part of the problem comes from the fluorescent lighting behind pictures of unappealing food, but often it is the fault of the photographer. If you just want some basic snapshots of food, don't worry about the lighting or the composition. Get out the point-and-shoot camera, click a few images and it's done. However, for appetizing, professional-level food images, you'll need better equipment. Taking images of food, whether with a digital or film camera, requires a little finesse and good equipment. It is an entire style of photography. 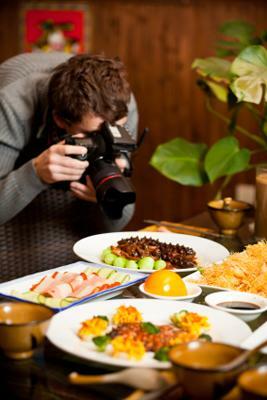 A single-lens reflex camera, whether a medium-format or 35mm-style, is necessary to get good food images. A lens that allows a lot of light in, as well as close focus - called a macro lens - will help get good images. Using an on-camera flash is a bad idea because it will cast sharp, distinct shadows that will make the food look unappetizing. If the images are intended for a menu, a catalog or some other glossy publication, it is a good idea to try some of the tricks the pros use. For example, when shooting images of a Thanksgiving turkey dinner, the bird is only partially cooked, and then the pro uses a blowtorch on the surface to give it that golden brown, mouth-watering look. Other food photography tips of the pros include the use of hairspray or a light gloss spray paint on food to make it look fresh and appetizing. This produces better images, but inedible food. To photograph edible food, there are some practical considerations. Only the food should be in focus, not any people or distracting backgrounds. For a natural look, use available light instead of a flash. A lens that has a wide aperture, such as f/1.8 or f/1.4 or even f/1.2 will help the camera have more light to focus upon and capture a good image. These apertures usually only appear on "normal" or 50mm lenses. Macro lenses allow the photographer to get really close to the food for images. These lenses focus down to within an inch or two. This also helps because it pushes everything else out of focus, which blurs the background, letting the photo's viewers see the food clearly. Setting the ISO speed on a digital camera to a high number such as 1,600 or 3,200 also will gather a lot more light for the image. This can produce the equivalent of film grain in the form of JPEG "noise," so it also is important to set the digital camera to the RAW setting. All digital images intended for anything bigger than a 4-by-6-inch print should be shot in RAW because this format gives a lot more latitude for image changes in photo editing software. If a film camera will be used for the food photography project, get the highest ISO film speed available. Some companies still make 3,200 ISO film, although only in black and white. Black and white food photographs can give the images an arty look, so don't discount it. Photographing food has two variations for the artist. The photographer can move and take a variety of angles and make several types of compositions, or the photographer can place the camera on a tripod and get one composition. Both have validity. In motion, the photographer can see angles and compositions not at first noticed. Using the tripod can appear static, but it will provide sharper images of the food because, shooting in natural light, it may be dark for the camera, which forces it to shoot at lower shutter speeds. This can translate into blurriness if the photographer moves the hand even slightly. These food photography tips can help give a different look to the images. Another consideration is the type of light available for the food images. Normal light bulbs produce an orange color on film or digital media without the white light of a flash. Fluorescent light comes out greenish yellow or sometimes blue. None of these colors will make food look appetizing in photographs. This can be fixed by changing the settings in the digital camera, adding a filter to the lens of the film camera, or more simply by adjusting the colors in post-production in photo editing software. What it all comes down to is whether the photographer has complete control by moving the food into a photo studio setting or whether the food must be photographed in the home, restaurant or kitchen. The reason high-end chocolates look so good in the catalog is that the photographer had control. Most tips from a pro would include getting control of the images.